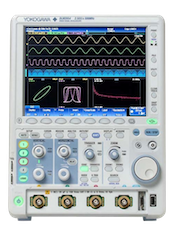 History Memory is Yokogawa’s unique method of preserving waveforms and triggers through automatic memory segmentation. With the DLM2000’s incredible 125 megapoints of memory, you can review up to 20,000 past waveforms. History memory is always activated, even when you are not reviewing it. It preserves all input channels, logic channels, and even math channels.